With our free donation pick up from donors homes or businesses, we are in need of someone who can assist us in our truck scheduling. In addition to scheduling, this volunteer will also help answer basic inquiries while answering the phone. Opportunities are available Tuesday through Saturday with basic hours being 9-5pm. Shifts are certainly welcomed during these hours. Perfect position for someone who is unable to stand for long periods of time, for someone who is unable to lift and someone who is excited to give back to their community in a positive way. We can arrange pickup of one-time donations of excess stock, or establish long-term partnerships with recurring donations in the County of Berkeley, SC. We put the proceeds from selling your donations to good use by building homes and hope. 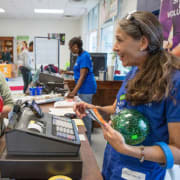 Though each Habitat ReStore is unique, most accept donations of household goods, furniture, appliances and building materials.